A Gram-negative rod, designated strain 1N-3T, was isolated from a rhizome of Phragmites australis grown in Kumtag Desert, China. Phylogenetic analysis showed that the strain is closely related to Phyllobacterium salinisoli LMG 30173T with 99.0% sequence similarity in the 16S rRNA gene and 92.9% in the atpD gene. Growth was observed at salinities of 0–4% (w/v), over a pH range of 5.0–10.0 (optimum 8.0) and at temperatures of 15–40 °C (optimum 30 °C). The predominant cellular fatty acids were identified as summed feature 8 (C18:1ω7c/C18:1ω6c). The G+C content of strain 1N-3T was determined to be 60.1%. 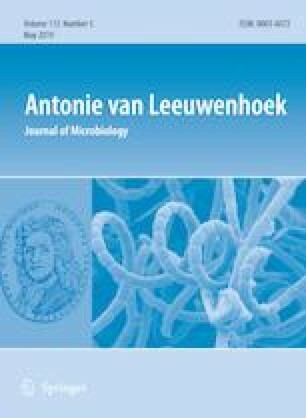 Based on phenotypic, chemotaxonomic, phylogenetic properties and genomic comparison, it is concluded that strain 1N-3T represents a novel species of the genus Phyllobacterium, for which the name Phyllobacterium phragmitis sp. nov. is proposed. The type strain is 1N-3T (=KCTC 62183T =ACCC 60071T). The online version of this article ( https://doi.org/10.1007/s10482-018-1195-5) contains supplementary material, which is available to authorized users. This work was supported by The State Key Research and Development Program of China (2016YFC0500801). No specific ethical or institutional permits were required to conduct sampling and the experimental studies did not involve endangered or protected species.